Today I discovered a great tool for blogging. I love discovering and sharing cool Infographics, but I just don’t have the skills to make them on my own. I also really love that autocorrect (or auto correct) thinks Infographic should be two words. So here is my first try and you can’t believe everything you’ll read here. 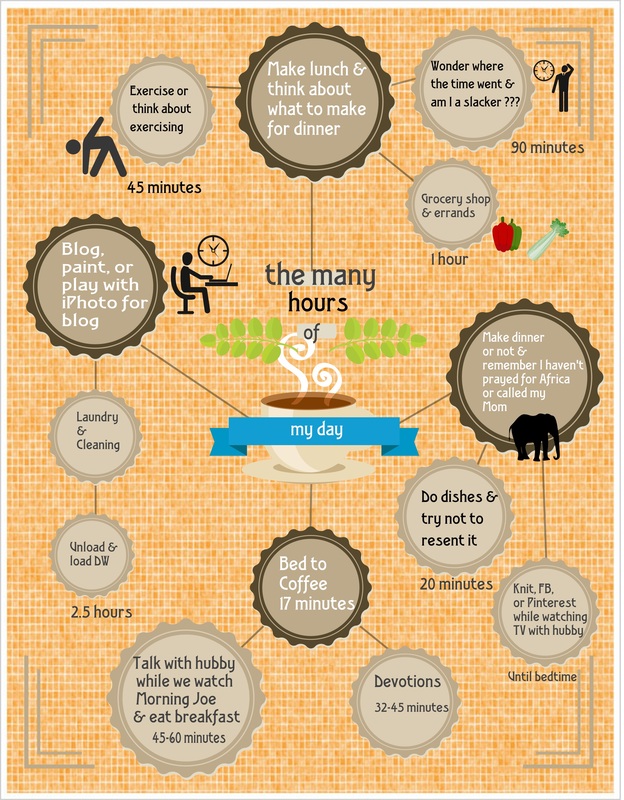 Selecting a template that featured coffee consumption throughout the day, I simply tweaked it to fit my optimal day’s activities. I totally don’t make dinner every night. I also don’t have Devotions every single morning. I couldn’t even write the part about exercising without laughing—all alone in my little office I’m still laughing. This is art and fiction folks. Homeschool Moms, you’ll find this sight helpful. I saw lots of examples that were done by kid’s for their reports/term papers. It’s free. At least until you get greedy about the objects and want more, more, more. Then you have to go Pro which currently costs $3.00/month but opens 1000s of images, lots of fonts, and a partridge in a pear tree. It’s super easy. Compared to sites like Canva, which I love even though it makes me want to tear my hair out and try it all again over on PicMonkey, easel.ly is a breeze to use. When they say drag and drop they really mean drag and drop. BOOM. You can sign up with FB which is the most fun I’ve had with FB in a week. Google + is the other option. No additional User Name or Password to keep track of, YEAH. It opens up about a million ways to share more visually engaging content. Think about using it for recipes, DIY, poetry, or as a storytelling tool. That just looks weird in print, right? You can find more cool resources from their list. Now it’s your turn to show and tell. Where are you finding new inspiration and help for your blog content? Goodreads has good collections of quotes from writers. Just Google your quote topic and their site comes up. Thanks Bob. I didn’t know this, I’ve only thought of Goodreads as a site for book reviews. I can’t wait to try it. A quote, a quote, my kingdom for a quote! Your day sounds like Carolyn’s. I had to laugh at some of those. Thanks so much for finding this and sharing it with us. I have always wondered if there was an easy way to do this. I took a closer look at the post from list.ly and there are other sites that offer tools for Infographics. I’ll have to try those too.